Light, airy, romantic, whimsical - today's elegant garden wedding in Toronto is filled with grace. Photographed by Toronto wedding photographer Tara McMullen Photography, real bride Kalla and her groom Lukas say I Do in front of a draped arch way in a sweet outdoor setting. The couple invited guests to toast and celebrate at their outdoor garden reception, which features decor details like gold flatware and garland centre pieces. Hear more from the bride and meet the entire Creative Team after the jump! A whimsical elegant garden party. The colours enhanced the natural garden tones of the already exquisite Graydon Hall venue grounds. The colour palette consisted of: ivory, champagne, sage and accents of gold. Kalla and Lukas wanted their guests to feel as though they had escaped the city and stepped back in time into an 'el fresco' dinner garden party, with a modern, sleek and elegant flare. Fun fact about the Bride is that Kalla is a professional Event Planner including Weddings, Corporate and Not-for-Profit events and has been working in the Industry for 10 years. To no surprise, her Wedding day was something she had thought about and been planning for her whole life. One of the best parts of planning her Wedding with Lukas was taking him through the journey and showing him all the elements of her work and passion while building the design together. 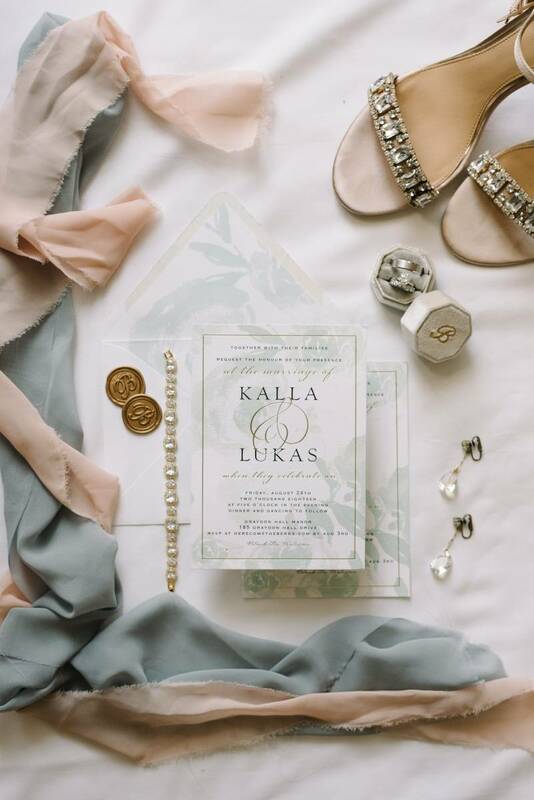 Most importantly, Kalla and Lukas wanted the wedding to be a celebration of love, not only for the two of them, but their beloved family and friends. After a tough year, Kalla having been diagnosed with MS and other serious health problems and some sad losses in the family, the Wedding was truly a celebration for all and they loved and enjoyed every moment and detail. It was a typical Wednesday night at Queen's University - Kalla was dressed up and ready to enjoy some wine at the go-to-student-club Alfie's on campus. Kalla was a common frequenter and night-goer with her gals, when she noticed from across the room a very tall, blonde and handsome man she had never met before; that would be because Lukas did not hit the dance floor very often (and still holds true); the timing truly was meant to be. After approaching this "mystery man" and enjoying a few dances together, they decided to get to know each other better, with a many delicious restaurant dates in Kingston. Kalla is not the easiest lady to surprise, being a planner and the boss of all celebrations. On March 31st, Kalla's Birthday weekend and not far after their 5-year Anniversary, Lukas planned a delicious dinner date at the Keg, a location that held a lot of memories, such as Kalla's University job, their first official date location in Kingston and many dates thereafter when they moved to Toronto. Not thinking anything of it, other than this being a great Birthday celebration, they wined and dined happily. Returning to their apartment in Midtown Toronto getting ready for bed, Lukas used Allie (their dog) as a clever distraction calling Kalla to take a look at something cute she was doing in the Family Room. To Kalla's surprise Lukas was on one knee beside Allie and asked the very important question "Will you Marry Me?". Filled with shock, happiness and excitement, it was a true "ugly cry" waterworks moment, Kalla even questioned if this was one of Lukas' (not so hilarious) April fools joke. She quickly realized (with the help of the gorgeous ring) that Lukas really did mean forever.